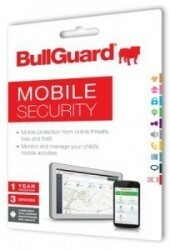 BullGuard Mobile Security is a cutting-edge app that delivers next generation security to protect users against a wide range of threats. It offers industry-leading defence to safeguard against the damage than can arise from loss or theft and provides an array of powerful tools unmatched by competitors. 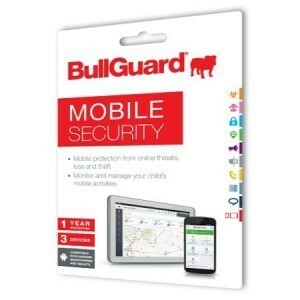 BullGuard Mobile Security is easy-to-use, provides intuitive operation and doesn’t drain batteries. The app also includes BullGuard Mobile Security Manager, a web-based platform that provides remote access to devices, and answers the problems of safeguarding data faced by today’s mobile users. Antivirus protects against malware, adware and trackware to keep a phone safe and nuisance-free. It features an ultra-fast cloud-based AV engine that has minimal impact on battery power and ensures the latest virus updates are always available and applied automatically without user intervention. An automatic scan checks apps as soon as they are installed and immediately notifies users of any malicious or suspicious code. A full manual full scan can also be carried out providing a complete summary of current phone status. Remote monitoring of virus events is also available through a PC via the web-based BullGuard Mobile Security Manager. Comprehensive Antitheft tools offer robust protection if a device is lost or stolen. Features include remote lock and unlock of a device, GPS locate, remote data wipe and a Scream function to help locate a device in the immediate area. If somebody tries to change the SIM the device automatically locks or wipes data. A backup module safeguards important data such as contacts, calendar information and SMS information. This backup feature provides a secure online drive with capacities up to 100GB. Users can also easily transfer data between a mobile device and computer ensuring swift and trouble-free data synchs. Mobile Security Manager is a web-based platform that allows users to remotely manage and monitor their device. It provides full control over the device controls and prevents the settings from being changed. It allows settings to be remotely changed by pushing the commands out to the device. For example, users can send antitheft commands, start antivirus scans remotely and also set up parental controls. Antitheft commands, scans to ensure the device is clean, management of spam filter blacklist or whitelist and the setting up parental controls can all be remotely managed. A powerful parental control module helps safeguard children. Parents can discretely monitor SMS messages, calls and pictures, and view applications that are being installed on a device. They can also activate GPS tracking to locate a device. All monitored information is available for review on the web-based Mobile Security Manager. Spam blocker. Keep it outA Call Manager tool can be used to automatically block or allow specific numbers. A short code block also halts spam messages which are typically sent from 3 to 5 digits phone numbers. The Blacklist allows you to add phone numbers manually or directly from your call history or contacts lists. Android 2.3 and 4.0 or higher. Android 3.x devices not supported.